Personal wealth is something that everyone aspires for as it can allow for a stress-free and enjoyable lifestyle. For the majority of people, financial freedom is not something that falls on your lap and instead it is something that you have to work for. It can be difficult to know how to take your personal wealth to the next level when you are comfortably employed and you have various expenses each month, but there are a few ways that this can be done which can have an enormous impact on your financial future. Read on for a few tips for taking your personal wealth to the next level. If you are in full-time employment, then it is understandable if you do not want to get another job as this can provide a great deal of stress and eat into your relaxation time (which is very important). Fortunately, there are lots of easy ways to supplement your income, including online jobs which you can do from the comfort of your own home and at a time to suit you. One of the most effective ways to increase the amount of money that you have each month is not to earn more but to spend less. Get a clear overview of your finances by drawing up a monthly budget and identify any areas where you could reduce or eliminate spending. This might include walking instead of driving, buying second-hand or non-brand products, cutting out unnecessary bills, switching provider, etc. The majority of people have some form of debt circling over them whether it is a student loan, credit card or any other type of debt. It is difficult to take your personal wealth to the next level when you are still in somebody else’s pocket, so do all that you can to clear or reduce this debt as once it is cleared, you can then focus entirely on creating your own wealth. Those that are intelligent with their money will set aside some of their income each month into a savings account as this is how you begin to build wealth. This can be challenging when you have bills to pay and mouths to feed, but the 50/30/20 budget is a great way to start saving no matter how much money you have coming in. This involves 50% of income going into essential expenditures (food, rent, utilities), 30% on non-essentials and the remaining 20% into savings/paying off debt. This can be tailored accordingly, but 50/30/20 is a good balance that will help you to start building wealth after just a few months. It can be all too easy to start saving money and then to lose interest after a few months and fall back into bad habits. Set regular, achievable goals as well as an end goal to keep you motivated throughout the year to improve your financial situation. It is fine to treat yourself from time to time, but make sure that you stay on target for a much brighter financial future. Investing can be a superb way to build wealth as it does not require a huge amount of work. It is difficult to know what to invest in, but experts like The 10 Minute Millionaire Insider can identify short-term stock trends that can very quickly line your pockets without having to lift a finger. It is important to check your credit rating annually to make sure that there are no mistakes and that you are in a healthy position. This is important as it means that you will be accepted and get access to the best deals should you ever need to borrow money (to buy a house, for example). Fix any errors immediately and take a few steps to improve your credit rating if it is not particularly high. It is all well and good to come up with a plan to start building for a financial future, but you need to take a regular look at this plan and your finances to make sure that you are constantly on track. Every few months, look through all of your incomings and outgoings to ensure that everything is as it should be as you may find that your spending has started to spiral or there are now expenses that you could cut out entirely. With money coming and going each month, it can be hard to remember to pay off your credit card, direct part of your paycheck into a savings account and managing your investments. It is for this reason why it is a smart move to automate as many of your financial moves as possible. This means that you will never miss a payment and you can rest assured knowing that everything is taken care of each month. One of the best ways to improve your financial situation is to make money management an important part of your life. Make sure that you read blogs, sign up to newsletters and join communities so that it is always on your mind and also so that you can always pick up on the latest advice and news from the world of finances. Over time, you will have all the knowledge for growing your wealth and creating a happier financial situation. No matter what your current financial situation is, there is a good chance that you will want to improve it so that you can build towards a brighter future. Although an intimidating task, it can actually be relatively straightforward to improve your situation with the above steps and it does not always have to involve earning much more money while spending a lot less. Combine a few of the above methods, and before long you will begin to notice that you are in a much healthier situation and your wealth is beginning to grow. Question: Do you know any other steps for taking wealth to the next level? You can leave a comment by clicking here. Do you like what you have read? Just add your name and your email below! Takis Athanassiou is an IT Consultant, Blogger, Trainer & Writer, active in the areas of leadership, business consulting, e-Learning and social media. He aims at the development of people, business and assets! You can check out his blog, add him in Google+ and follow him on Twitter. Subscribe to my newsletter and join a community of 21,000+ like-minded leaders, entrepreneurs, business owners, freelancers, and individuals! Get a FREE copy of my eBook along with proven approaches, case studies, exclusive content, valuable tools, and giveaways in your inbox. [FREE COURCE] Do your know your Niche Market? This is a small free course for defining your ideal niche market. It is a course for the entrepreneurs, business owners and freelancers want to learn more about their niche market and connect effectively with the people matter most to their business. Learn More About content marketing with this quiz! How To Lead With Impact? Hi, my name is Takis Athanassiou. I've been working for over 23 years in IT sector, as Business Advisor, Consultant, Project Manager, Team Leader and Director in Greek SMEs, focused mainly on areas of IT services, e-Learning and consulting. The book "Towards Personal Productivity" is a comprehensive resource which will help you to focus on the important things and do what's matters. 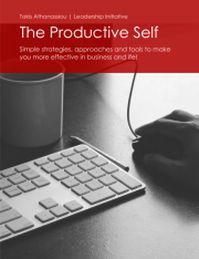 The book focuses on the 3 main areas you need to address (and master) in order to become more productive. Namely the concepts, the approaches, the systems, and the tools you can employ to become more effective. Get it now and start making a difference! ©2019 Takis Athanassiou. Powered by the Get Noticed! Theme. Subscribe to my newsletter and join a community of 23,000 like-minded leaders! Start making a difference in your life and business with well - proven strategies and ideas.